Today facebook become a good social networking site it helps people ot discuss their matter without nay cost online .It has million of users till date .Many user are online all time but they don’t know about facebook. So why are you wasting your time , just cool now iam try to give you give some tips which helps you a lot . 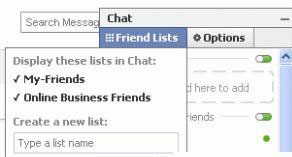 Facebook is a marvalous chat option and the most useful feature in FB .Some time your’s all friends are online and you want to talk with some friends and you also try to ignore them by don’t reply .So to solving problem you appear online to selected friends to whom you want to talk . Go to Chat found at the lower right side of the page and then, click on Friends List. A small window will appear where you can type and create a new list. You could name it anything you want. On your newly created list, select and start dragging those names that you wish to block. Then set your status to appear offline to this particular group of friends. With this, you now appear completely invisible to them. Try it now. To make your FB experience a lot less complicated, I suggest you try using the Facebook Toolbar. This feature only works on Mozilla firefox browser. This allows you to find, share, check your notifications and messages, and even update your account effortlessly. Just click on the buttons found in the toolbar then you’re there. To get this cool Mozilla Add-on, simply click on this link and click install. 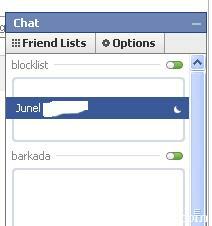 Once you’ve installed this application, you can now log in to your Facebook account using this toolbar.